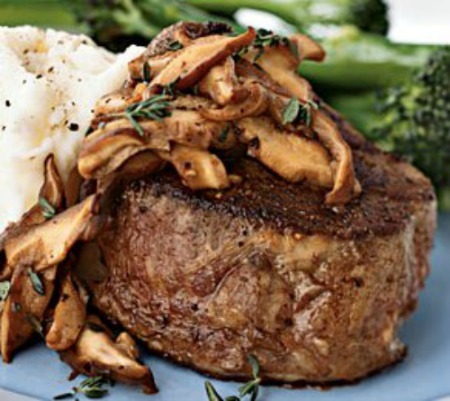 Steak lovers will fall in love with this beef tenderloin steak with morel mushrooms! The flavor of the steak sfuffed with morels and cooked in a savory mushroom wine sauce is outstanding. Your friends and family will feel like they are eating at a 5 star steak house when you serve this dish. This fantastic steak recipe originated from Tony’s Restaurant in St. Louis, Missouri. 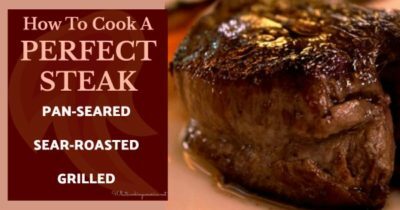 Cooking the Perfect Steak – Learn how to cook the perfect steak. Check out all of Linda’s Beef Recipes using various cuts of beef. Making Mushroom Stuffing: Heat 4 teaspoons olive oil in a medium skillet over medium heat. Add 2 tablespoons shallots and sauté 1 minute. Add chopped mushrooms; sauté 5 minutes. Season stuffing with salt and pepper. Cut small slits or pockets (2 1/2-inch-wide by 1 1/2-inch-deep) in the side of each steak. Press 1/4 of Mushroom Stuffing into each pocket. Secure with toothpicks. Set aside until ready to cook. Add prepared Mushroom Sauce to skillet; bring to simmer, scraping up any browned bits. Spoon prepared Mushroom Sauce over steaks. Photo from My Recipes web site.